Cardiac amyloidosis is the most common cause of restrictive cardiomyopathy, involving extracellular tissue deposition of various serum proteins. Up to 50% involve AL amyloid, its most severe form, which causes drastic cardiac dysfunction with a 38% 1 year-survival rate. Diagnosis of cardiac amyloidosis remains difficult outside endomyocardial biopsy. Cardiovascular magnetic resonance has been studied and used as a non-invasive method for diagnosis. The myocardium exhibits a diffuse late enhancement pattern as well as a shorter T1 after contrast administration (Circulation 111:168–193, 2005). We aim to describe a role for pre-contrast cardiac MRI in the evaluation of cardiac amyloidosis by evaluating its T1 signal using both quantitative and qualitative measures. To assess T1 signal in patients with suspected cardiac amyloidosis using a T1 weighted gradient echo (T1-GRE) technique and compare it to findings in an age-matched control group. 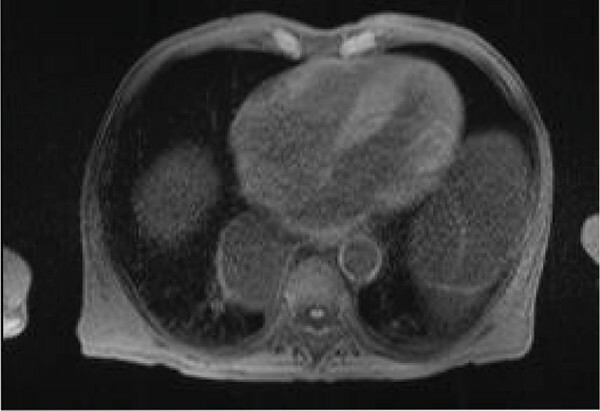 A group of 15 patients (age: 28–88 yrs) with high suspicion of cardiac amyloidosis on MRI was compared to a group of 10 normal patients (age: 28–75 yrs). All patients underwent cardiac MRI on a 1.5 T Siemens Avanto scanner. The MRI protocol consisted of multiplanar single-shot and cine TrueFISP, non-contrast T1-GRE imaging, cine TrueFISP "TI" scout and delayed enhanced phase-sensitive inversion recovery TurboFLASH. 0.2 mmol/kg of Gadolinium-DTPA (Magnevist) was injected intravenously. Images underwent both quantitative and qualitative evaluation. For quantitative assessment, signal to noise (SNR) and contrast to noise (CNR) were measured on T1-GRE images. The inversion time (TI) to null myocardium was measured using TI scout. For qualitative assessment, T1-GRE images were evaluated by observers and SNR and CNR were scored using a Likert scale. The presence and pattern of enhancement were noted on PSIR TurboFLASH images. Statistical significance was performed using 2-sample Student's t-test. A cadaveric heart with autopsy-proven cardiac amyloidosis was compared to a normal cadaveric heart. 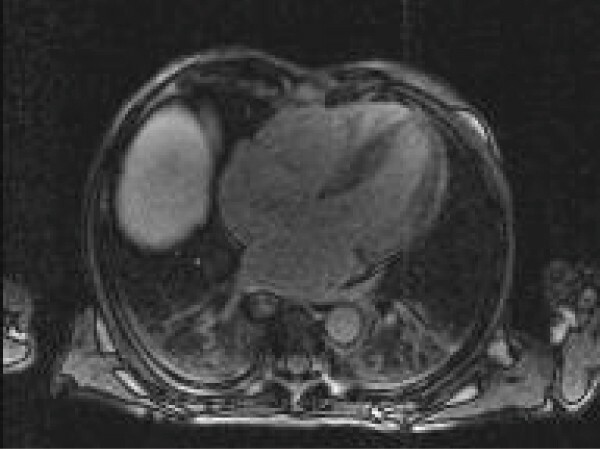 Both hearts underwent MRI on a 3 T Siemens TIM Trio scanner using a Look-Locker sequence. T1 value was calculated using a curve-fit model. All 15 patients in the amyloid group had characteristic diffuse subendocardial or transmural enhancement on delayed enhanced images (Figure 1). Three patients had biopsy-proven amyloidosis. The control group had no abnormality. On T1-GRE images, the mean SNR and CNR in the amyloid group was 102.8 and 42.7 versus 69.1 and 22.2 respectively in the control group (p < 0.05) (Table 1). SNR and CNR were scored significantly higher in the amyloid group (Figure 2) compared to controls (Figure 3) (p < 0.01). The average TI in the amyloid group was 143.6 msec versus 197.1 in the control group (p < 0.01). Mean T1 of the amyloid cadeveric heart was 345.1 msec compared to 503.94 of the normal cadaveric heart (Figure 4; amyloid heart above, normal below). Left ventricular myocardium is T1 hyperintense on pre-contrast T1-GRE imaging in patients with suspected amyloidosis compared to normal controls. 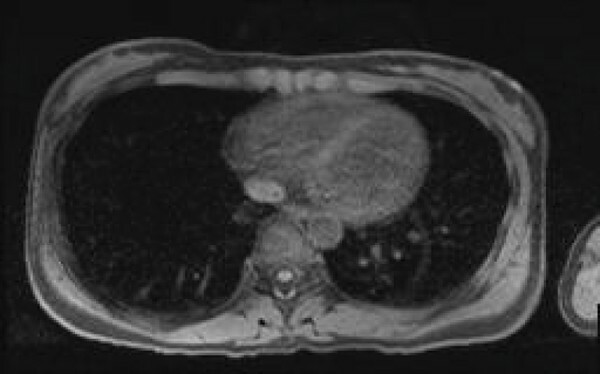 Patients with suspected amyloidosis also have a shorter TI compared to controls following contrast administration. Furthermore, myocardial T1 of an amyloid cadaveric heart is shorter compared to that of a normal cadaveric heart. Pre-contrast left ventricular myocardial T1 hyperintensity may be a useful discriminatory MRI finding in patients with suspected cardiac amyloidosis and therefore should be an integral part of the cardiac MRI protocol.